Subscribe to our Free E-Magazine on Aromatherapy. • Care and Selection of Ar.. • Chemical Composition of .. • Production Methods for A..
• Aromatheraphy oils and o.. • Using Aromatheraphy oils.. • Essential oils in Aromat..
Aromatheraphy Essential oils are the aromatic and volatile constituents found in plants. These constituents contain the essence of all the active properties of that plant. Chemically, essential oils are made up of alcohols, aldehydes, ketones, phenols, terpenes, sesquiterpenes, ethers and esters. In the living plant, these aromatheraphy essential oil components are used as hormones for growth and reproduction, plant pheromones for smells which will attract pollinating insects, defense mechanisms protecting the plant from predators (herbivores and insects), and also protection against bacterial, viral, or fungal invasion. Aroma oils or Essential oils are subtle, volatile liquids that are extracted from plants, shrubs, flowers, trees, bushes, herbs, spices, woods and fibres, usually by distillation, expression and solvent extraction. Essential oils can be derived from all parts of the plant. 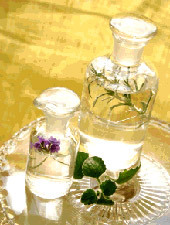 The lowers produce Aromatherapy oils that often have sedating, narcotic or relaxing effects on the body. The resins, woods, barks and exudates produce heating aromatherapy oils that actively move fluids in the body. The leaves often have healing and cooling properties coming from the green color of chlorophyll (very closely related to our hemoglobin structure). The roots contain many of the earth properties of the plants and can be very grounding. The fruits produce essential oils that are very expanding, opening and stimulating. Essential oils are the "Life force of the plant". And just like the plant characteristics are inherited from the plant families, the oil characteristics will follow the common properties representative of their plant families. By knowing the plant family to which the oil belongs to, we can better understand its basic nature, properties and effects. For example, all the oils belonging to the pine family like cedar and Juniper has strong, hot antiseptic characteristics. Listed below are ten families, which happen to include sixty major plants used in making essential oils. Burseraceae (Resin Family) - These are the essence of the dessert shrubs and trees. Frankincense, myrrh and all the oils from this family are excellent for meditation. Coming from the tropical desert, they bring heat, contain energy to move fluids, cleanse infection, heal wounds and build strength in the blood. Composite (Sunflower Family) - Chamomile, immortelle, tansy, tarragon, dhavana and yarrow - most of these oils are made from soothing flowers and are known to be healers of the skin, nerves, blood and bones. Sedating to the nerves and emotions, they are known as anti-inflammatory, immune builders, and cleansers. Coniferae-Pinaceae (Pine Family) - Fir, cedar, cypress, juniper, pine, and amber these oils are made from the strong aromatic wood, sap or fresh needles. They are all strong, hot, antiseptic, fluid-moving, possible skin irritants, clarifying, and grounding to the mind. Graminae (Grass Family) - Citronella, lemongrass, palmarosa, vetiver- these strong aromatic grasses are uplifting, grounding, diuretic, immune and endocrine builders. Just as grasses (grains) are the basis of diet, the grass oils give us basic notes for blending. Labiatae (Mint Family) - Basil, Clary sage, hyssop, lavender, lemon balm, marjoram, patchouli, pennyroyal, peppermint, rosemary, sage, savory, thyme all of the mint family are olfactory overachievers. They are medicinal plants with properties as aromatics, carminatives, immune stimulants, balancers and mood elevators. Lauracea (Laurel Family) - Cassia, bay, camphor, cinnamon, rosewood-these trees Produce oils from their wood, bark and leaves that are stimulating, bring fire, fluid movement and create energy enhancement. Myrtaceae (Myrtle Family) - Cajeput, clove, eucalyptus, myrtle, niaouli, nutmeg, and tea tree-chese trees are so strong that they have no natural enemies. These oils give us inner strength. They are anti-inflammatory, antiseptic, respiratory tract beneficent and immune stimulants. In blends they are clean, refreshing, and medicinal. Rutacea (Citrus Family) - Bergamot, grapefruit, lemon, lime, mandarin, Neroli, orange, petitgrain, and tangerine this family is known for its fruit and flowers. In blends they are clean and refreshing, uplifting, invigorating, opening, warm, fluid moving, stimulating and encouraging. Our life is richer because of citrus. Umbelliferae (Carrot Family) - Angelica, ajwan, brahmi, galbanum, anise, caraway, carrot seed, coriander, cumin, dill, fennel, parsley rival to the mint family in healing properties, they characteristically reach out with flowers and foliage to embrace the sun and air elements. They are carminative, rejuvenative, stimulant, tonic, regulators of hormones and useful in skin care. Zingibcraceae (Ginger Family) - Carilamon, tumeric, ginger these spicy roots bring the fire and earth elements to us. They are grounding, heating, digestive stimulants.